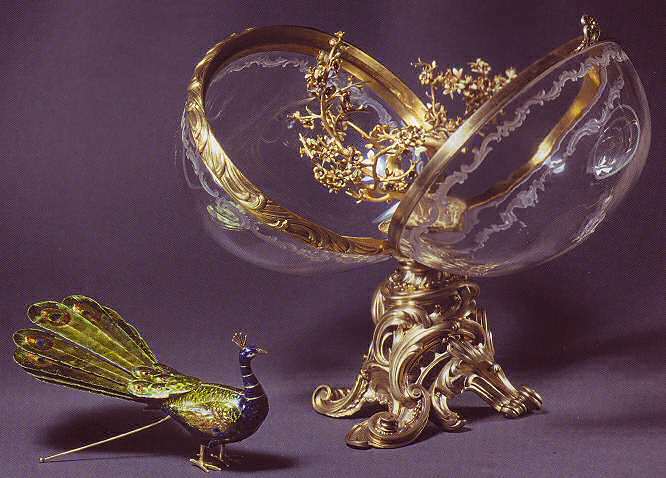 The wonderful 1908 Peacock Egg is made of rock crystal and silver-gilt. 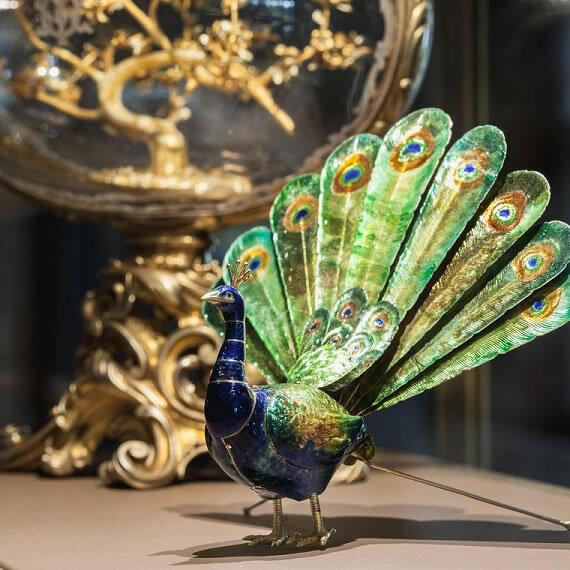 The Peacock surprise is made of varicolored gold, varicolored enamel and precious stones. The Two Egg halves are each with a heavily chase silver-gilt rococo mount. Both engraved, one with the crowned monogram of Maria Feodorovna and the other with the date, 1908. Within the Egg, a mechanical gold enameled peacock sits in the branches of an engraved gold tree with flowers in enamel and precious stones. The peacock can be lifted from the tree and wound up. Placed on a flat surface, she struts proudly around, moving her head and spreads en closes her varicolored enamel tail from time to time. 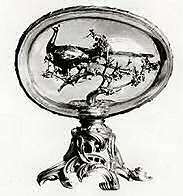 The concept for the Peacock Egg is derived from the famous 18th century Peacock Clock by James Cox, originally housed in the Winter Palace, now the Hermitage Museum in St. Petersburg. (see picture). 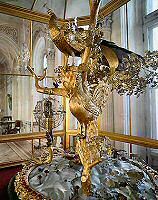 This clock had been a present to Catherine the Great from Count Grigorii Potemkin. This clock is in a sort of cage with the size of a small room. The maker of the peacock, Dorofeiev, worked, including on the prototypes, three years to make it. In 1927 the Peacock Egg was one of the nine Imperial Eggs sold by the Antikvariat to Emanuel Snowman of Wartski in London. 1935 owned by a Mr. Hirst, c/o Wartski London. 1949 Owned by Dr. Maurice Sandoz, Switzerland. 1955 Fondation Edouard et Maurice Sandoz, Lausanne, Switzerland. The Peacock Egg is not often seen publicly! Beautiful pictures of the Peacock Egg in this article: The art of watch restoration: bringing the past to life. Note the image of the Peacock Egg further IN the article; click the "+" sign to enlarge and see a high resolution photo of the Egg, showing all the details! The image above is from the same website! Update Januari 2017. A YouTube movie is now available where you can see the Egg in all its glory! See movie index page.